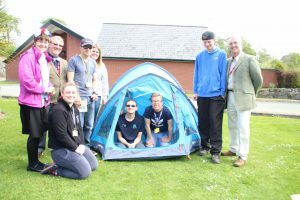 A group of students have benefitted from the generous donations of local lodges in Oswestry who have sponsored the recent Duke of Edinburgh’s (DofE) Award expeditions. The students have participated in the Awards for a number of years and the benefits to students include confidence building, team working as well as developing skills for life and independence skills. The Bronze, Silver and Gold Awards expeditions have included walking, overnight camping and canoeing on the River Wye and River Severn in rain, sunshine and everything else that the British weather threw at them. Derwen College based in Gobowen, Shropshire is a residential specialist college for young people aged between 16 and 25 with learning difficulties and disabilities, the college is celebrating 90 years this year. More information about the work of the college can be found at www.derwen.ac.uk.